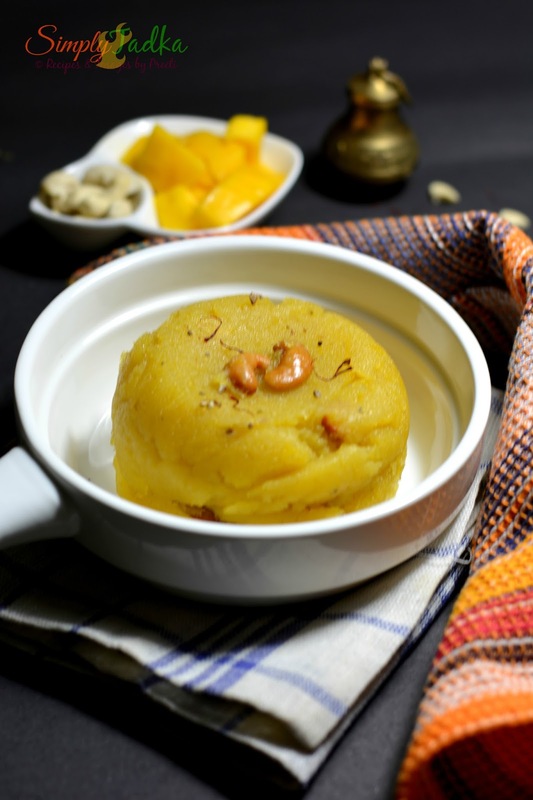 For this recipe, I used kesar mango, first clean and blend the mango pulp in mixer till to smooth texture, after that cooked with roasted semolina in clarified butter or desi ghee. Without using any food color, its look so pretty, glossy and flavorful. Heat the ghee in non-stick pan and side by side boil the water in separate sauce pan, If you are vegan just dry roast the semolina in non-stick pan. ghee and roast till to light brown color. Add sugar and cardamom powder, mix again. Now it’s look alike glossy and shiny. festival recipes, cashew recipes, diwali recipes. Such a tempting rava Kesari and the colour is truly beautiful. Very tempting kesari. I was confused seeing that ghee is an ingredient in this kesari and it was categorized as Vegan. 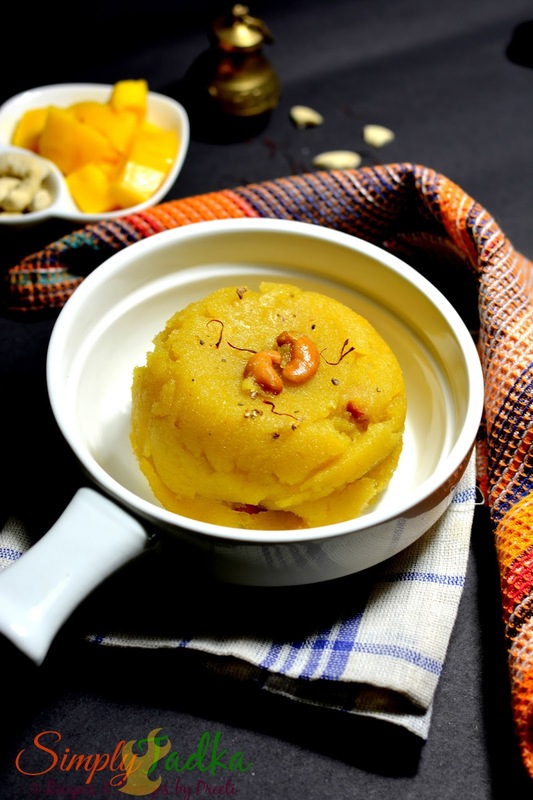 You need to substitute ghee to make it vegan Preeti , though the Kesari looks super . That is such a delicious looking mango kesari. Looks amazing. That kesari looks so sinful Preeti..very inviting! 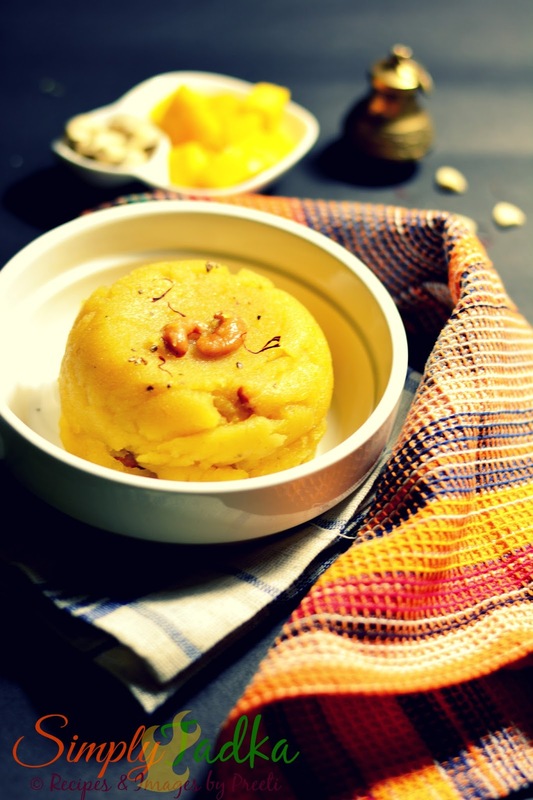 Preeti the kesri is delicious but for vegan sweets no ghee is used. Same pinch… I posted kesari too last week. very nice. Just drooling here, how delicious this kesari looks. One must try recipe this Mango season!! I am a mango fanatic and know I would love this! I love kesari, adding mango makes it more delicious and tempting.